Prehistory means the period of time where there was no written document. Since written document is not available, archaeology and anthropology play extremely important roles in order to understand prehistory. Because new and detailed analytical methods have been introduced into the Amami and Okinawa archipelagos for last twenty years or so, prehistory of this region has been much more clearly understood. This symposium is organized in order to share the portion of the latest data to the people of Amami islands. The symposium consists of six themes. 1) DNA analysis, which has become very popular in recent years, provids some pieces of information about where people came from. Based on DNA data, Ken-ichi Shinoda will talk about the origin of the Amami and Okinawa people. 2) Masami Takenaka, an osteologist, will discuss physical characteristics of the prehistoric people in this region. 3) The carbon and nitrogen isotope analysis of human bones shed light on diet of prehistoric people. Minoru Yoneda will demonstrate what kind of food Amami and Okinawa islanders consumed prehistorically. 4) Takeji Toizumi, a faunal analyst, will introduce what kind of vertebrate animals were eaten during prehistoric time and attempt to reconstruct paleoenvironment. 5)Taiji Kurozumi, who is specialized in shell analysis, will explain shellfish utilization patterns in the prehistoric time. Also he will introduce paleoenvironment based on the analysis of endemic land snails. 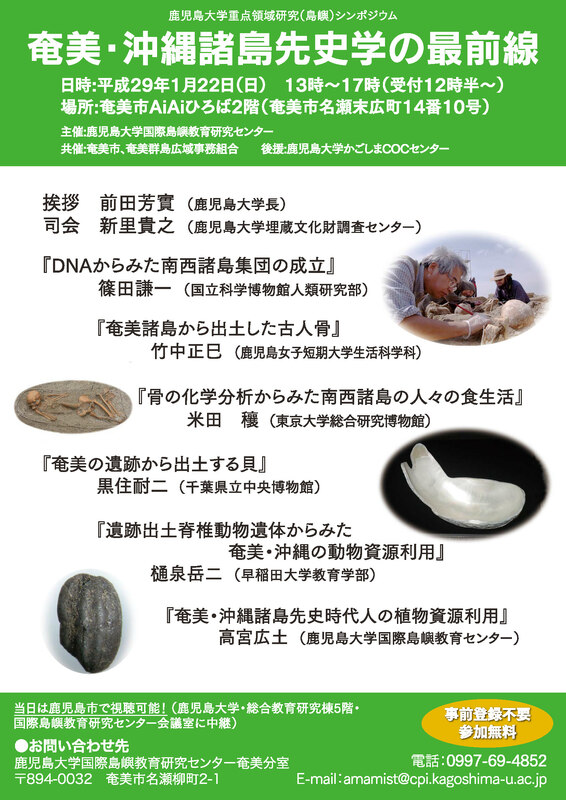 6) Finally, Hiroto Takamiya will discuss plant food consumed by the prehistoric people in the islands. He also will show when transition from hunting and gathering to food production took place. We will try to avoid jargons in order for the participants to understand our talks easily. The origin of the Japanese population remains controversial, although multidisciplinary approach is being used to address this issue. The DNA analysis of ancient human remains is useful in this regard because it provides information on the genetic characteristics of a society that existed at a specific time in the past. Ryukyu Islands are the southwest island chain in Japan. Due to its geographical position, these islands are thought to play an important role of the migration route from Taiwan and Southeast Asia to the Japanese archipelagos. Archaeological excavations have been conducted on these islands and the skeletal remains excavated were from sites ranged from the Shellmidden period to the modern period. By the 12th century, the hunter-gatherer lifestyle began to change with the advent of an agricultural society in all parts of Ryukyu Islands included the Amami islands. The relationship between the hunter-gatherers who inhabited this region in ancient times and the farmers who arrived later on has been particularly interesting; however, little is known about their biological relationships. Genetic analysis of ancient human remains is the most effective biological approach for determining the relationships between these people. In order to obtain more information on the genetic characteristics of this southwest island chain of Japan, we are currently analyzing DNA extracted from human remains that were excavated from cemeteries belonging to the Neolithic to early modern periods. Our study of unraveled the genetic continuity between the ancient and contemporary populations of the Ryukyu Islanders. However these conclusions must be regarded as tentative since they are based on small sample sizes, even though the analysis has been highly efficient. Thus, we believe that further experiments to obtain more detailed data on the human skeletal remains from the Ryukyu Archipelago are important. We hope to pursue this matter in future studies. Many prehistoric and historic human skeletal remains from the Amami Islands are collected and examined, recently. Prehistoric people in Amami were different from modern Japanese with many distinctive skeletal characters, such as the prominent nasal bones, broad and low face, edge-to-edge bite, long distal limb segments, low stature and so on. Most of these characteristics are shared by Jomon and modern Hokkaido Ainu in Japan. Medieval people in Amami, on the other hand, share their characteristic features, such as dolichocranic vault, taller and narrower face, flat front nasal profile, distinct alveolar protrusion, and so on, with people of mainland Japan. Drastic physical changes occurred to Amami inhabitants during protohistoric and medieval period under strong genetic and cultural influences of the immigrants from the mainland Japan and surrounding areas in east china sea who introduced agriculture and other technology to the Amami Islands. The Nansei Islands of southwestern Japan is unique field of human occupational history. The Pleistocene human remains from Okinawa, Ishigaki, and Miyako islands provide us very special opportunities to investigate the human who could survive on island far before farming. Even in ancient history, these island is important especially in light of trading between China, Taiwan, Korea and Japan. We have analyzed from a series of human remains from the southwestern islands including the Gusuku and Kuzuri sites on Kikai Island, which produced important archaeological evidences suggesting its key role in this region. The isotopic analysis of carbon and nitrogen in human bone collagen suggest dynamism of human occupation history through the change of diet including millet agriculture. The period between ca.10,000 years ago and 1,000 years ago is called the Shellmidden period in the Amami and Okinawa prehistory. During this period, people were fishers and gatherers of the coral reef resources and utilized various thick shells from this environment as goods and exchange items. Among shellfish remains recovered from the Amami Islands, people ate conch (Strombus lufuanus), marine snail (Turbo marmoratus, yakogai in Japanese common name) and bivalve (Tridacna spp.) which are consumed even today. This implies the taste has not changed for several thousand years. Large-sized yakogai are frequently recovered in large quantities in Amami archaeological sites. The sites dating between the 6th and 9th centuries AD in Amami have yielded a large amount of yakogai, and it has been hypothesized that the shells were exported from the Amami Islands to either mainland Japan or China as mother-of-pearl work. These hypotheses are known as the yakogai exchange. Some feel that this exchange lasted up to the 10th to 11th centuries AD. However, since there is no site exist which unearthed large amount of yakogai dating between the 10th and 11th, I think the exchange in the latter period should be seriously examined. Fisher-gatherer societies, which　continuously existed on the islands, drastically changed to crop agriculture societies during the later part of the Shellmidden period or just beginning of the Gusuku period. As of today, we do not clearly understand what was happening during the transitional period. Numerous amounts of land snails, which were not utilized as foods, have been also recovered from archaeological sites. They inhabit in only limited area and sensitive to the changes in the surrounding environment. Some of them are endemic species in particular islands. Erabumaimai (Nesiohelix irrediviva), which today only distributed in the central part of virgin forest in Okinoerabu Island, was recovered from the Sumiyoshi shellmidden located near the seashore. The fact indicates the island was covered by dense forest at that time. The extinct snail recovered from the Hosu cave site is also indicative of human imposed environmental change. The land snails recovered from sites often reveal human imposed environmental changes in the past. Archaeological sites in the Amami and Okinawa Islands often unearthed large amount of vertebrate (fishes, birds, and mammals) remains. The results of the analysis of these remains indicate that there are three distinctive periods in the vertebrate utilization in this region. First is between 7500BP and 5000 BP (Early 1 to 2 Shellmidden periods). During this period, at the beginning wild boar was heavily hunted and at about 6000 BP, fish species suddenly increased. While we still do not understand why this change took place, two possible explanations are as follows. Firstly, it might coincide with the emergence of coral reef environment around the islands and/or secondly, Kyushu Jomon people might have influenced the islanders. Second is between 5000BP and the 10th century AD (Early 3 to Late Shellmidden periods). During this period, vertebrate remains are characterized by coral reef fishes and wild boar. This strategy lasted for 3000 to 4000 years. This suggests that people lived harmoniously in the resource poor islands for a long period of time. This stability in island environments is very rare phenomena in worldwide and is worth specific mention. Third is from the Gusuku period to the Recent period. During the Gusuku period (the 11th century onward), accompanied with the beginning of food production, important draft animal, cattle, predominated vertebrate remains. It also includes other domesticated animals such as horses and pigs. At the same time, fish remains decreased from vertebrate remains indicating the coral reef resources became less important during the Gusuku period. In the Okinawa Archipelago, drastic decrease of Ryukyu mountain turtles (Geomyda japonica) from the Gusuku sites indicates deforestation during this period. The introduction and spread of agriculture during the Gusuku period brought about overall and multiple changes in relationship between human and nature. When I was a student, I learned that like the Amami and Okinawa archipelagos, which are located in southern latitude, plant food must have played very important role in prehistoric times. However, at that time there was almost no information on what people ate during prehistoric times in this region. One reason was that researchers in the region believed that it was extremely difficult to obtain plant remains from the sites in these islands. Indeed at that time plant remains had been known from a handful sites from the Amami and Okinawa archipelagos. About twenty years ago, I introduced flotation method in order to obtain carbonized plant remains from archaeological sites in the Amami and Okinawa archipelagos for the first time. Unlike expectation, many sites yielded only small amount of plant remains. However, they have demonstrated two important matters. First, during the Shellmidden period (ca. 6500 to 1000 BP), people in the region were hunter-gatherers. Until the introduction of flotation, several Shellmidden period agriculture hypotheses had been proposed. However, they are all denied. Secondly, the result of flotation has revealed when food production began in this region. It was about the eighth to twelfth centuries AD in the Amami Archipelago and the ninth to twelfth centuries in the Okinawa Archipelago.